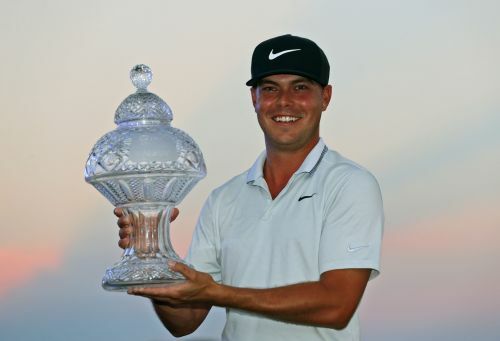 PALM BEACH GARDENS, Fla. (AP) — Keith Mitchell made a 15-foot birdie putt on the final hole Sunday to win The Honda Classic for his first PGA Tour victory to earn a trip to the Masters. Mitchell closed with a 3-under 67 to finish at 9-under 271 at PGA National, one stroke ahead of Brooks Koepka and Rickie Fowler. "I was trying to focus on what was going on," Mitchell said. "My mind started wandering there a little bit at the end ... and then I hit a great putt." Mitchell was one shot behind going into the final round, bogeyed the opening two holes and fell as many as four shots behind before slowly getting back into the mix, and then pouring it on with four birdies over his last seven holes. All he had to do was hold off Koepka, the reigning PGA Tour player of the year and three-time major champion, and the always popular Fowler. Koepka finished with two birdies on the last three holes for a 66, while Fowler made three birdies over his last four holes, including a 45-foot putt on No. 17, for a 67. But Mitchell didn't waver in the wind. He was on the upslope of a fairway bunker on the par-5 closing hole, about 205 yards from the pin for his second shot. All he could do from there was blast out to the fairway, leaving a wedge to the green. That checked up about 15 feet below the hole, giving him a putt to win. He made it, pumped his fist and waited for the final group of Wyndham Clark and Vijay Singh to finish about five minutes later. Mitchell finished at 9-under 271 and earned $1,224,000. Singh, at 56 trying to become the oldest winner in PGA Tour history, was among those tied for the lead on the back nine. He fell back with a tee shot into the water hazard on the 17th hole. Singh closed with a 70 and finished sixth. SINGAPORE (AP) — Sung Hyun Park birdied five of her opening seven holes, added four birdies on the back nine and closed with an 8-under 64 for a two-shot victory in the HSBC Women's World Championship. Park began the final round at Sentosa Golf Club four shots behind Ariya Jutanugarn, the No. 1 player in women's golf. Jutanugarn closed with a 75. Minjee Lee was tied for the lead briefly on the front nine and shot 69 to finish alone in second, her second straight runner-up finish..
Park won for the sixth time on the LPGA Tour. "I think my training in the last winter really helped me a lot, and it also helped me to be stronger with my play," Park said. "I didn't think I would win this fast. ... I think I will play really comfortable the rest of my season." The LPGA Tour is off for two weeks before returning in Arizona at the Founder's Cup. TUCSON, Ariz. (AP) — Mark O'Meara seized control with five birdies on the front nine and closed with a 7-under 66 for a four-shot victory Sunday in the Cologuard Classic, his first victory on the PGA Tour Champions in more than eight years. The 62-year-old O'Meara had a one-shot lead going into the final round and stretched it to four going to the back nine. He was never seriously challenged the rest of the way to pick up his first victory since the Senior Players Championship toward the end of the 2010 season. Darren Clarke holed a 50-foot birdie putt on the 18th for a 68 to tie for second with Willie Wood, Kirk Triplett and Scott McCarron, who each had 69. O'Meara had gone 152 starts on the PGA Tour Champions without winning. He ended the second-longest stretch between victories on the 50-and-older circuit at eight years, four months. Craig Stadler went eight years and six months between victories. "I knew there was going to be a lot of pressure," O'Meara said. "To play the front nine the way I did, I'm really happy." O'Meara finished at 17-under 202. Former baseball star John Smoltz tied for 53rd at 1 over in his tour debut, closing with a 73. The 51-year-old Hall of Fame pitcher got into the field on a sponsor exemption. MUSCAT, Oman (AP) — Kurt Kitayama had six birdies and an eagle to salvage a 1-under 71 in the weather-delayed third round in the morning, and then birdied two of the last three holes in the afternoon for a 70 and a one-shot victory in the Oman Open. The 26-year-old American won for the second time this season on the European Tour. Kitayama was one shot behind after 36 holes when he began the third round with a quadruple bogey and two bogeys before it was halted by darkness. He had to play 33 holes on Sunday to cap off the victory over Jorge Campillo (69), Clement Sordet (70), Fabrizio Zanotti (74 and Maximillian Kieffer (72). Kitayama, a California native who played at UNLV, won the Mauritius Open late last year after getting through all three stage of Q-school to earn a European Tour card. Americans now have won six of the 12 official events on the European Tour this year. Kitayama and Dustin Johnson (Saudi International, Mexico Championship) have two victories each. Bryson DeChambeau (Dubai Desert Classic) and David Lipsky (Alfred Dunhill Championship) were the other winners. Zach Murray closed with a 4-under 68 to win the 100th New Zealand Open by two shots over Ashley Hall and Josh Geary. The 21-year-old Aussie won for the first time as a pro. He previous had won the WA Open on the PGA Tour of Australasia when he was an amateur. ... Anne van Damn closed with a 6-under 65 for a three-shot victory in the Canberra Classic to win her fourth title on the Ladies European Tour.